Mega Sale! Save 26% on the CHAUVET DJ Wash FX 2 Projection Lighting Effect by CHAUVET DJ at IGWT. MPN: WASHFX2. Hurry! Limited time offer. Offer valid only while supplies last. Is a multi-purpose effect light with 18 Quad-color (RGB+UV) LEDs that can be used as a regular wash light or eye-candy effect with 6 chasing zones. 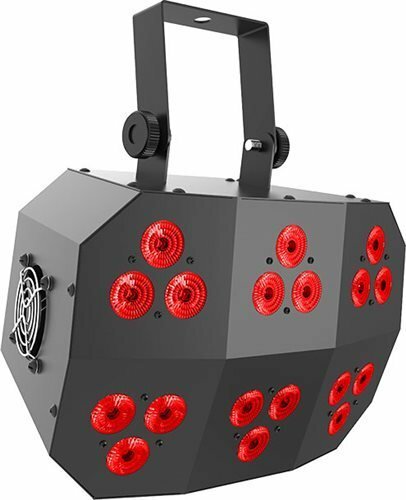 Is a multi-purpose effect light with 18 Quad-color (RGB+UV) LEDs that can be used as a regular wash light or eye-candy effect with 6 chasing zones. Powerful UV LEDs create a psychedelic blacklight effect and provide brilliant color-mixing capabilities. Wash FX 2 can be controlled with the IRC-6 wireless remote for wireless triggering or in stand-alone, DMX, IR or master/slave modes. Fits best in the CHS-40 VIP Gear Bag.